The C28 Dragonfly was introduced in 1994 and was the first Spyderco knife featuring a 50/50 forefinger-choil. 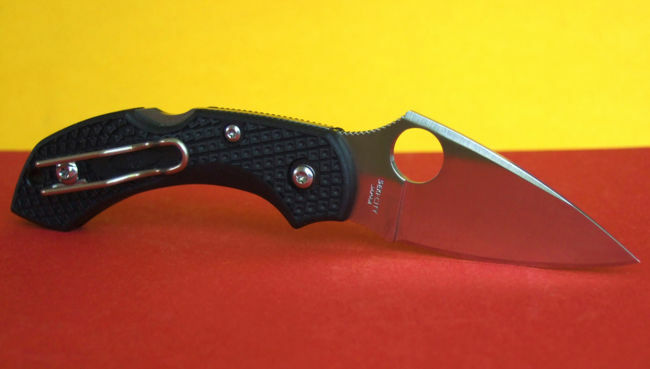 The C28 Dragonfly appeared in all Spyderco product catalogs since 1994 (older, newer). Review of SS Dragonfly by "vampyrewolf". Dragonfly S/S PE - review by "datan". "Many of us buy small gentlemen's knives assuming we'll use them for undemanding cutting chores. While that is normally the case, the Dragonfly's diminutive size belies its cutting capabilities. When need be, it will cut and perform like a much larger folder because Spyderco's R&D team focused on creating a small but ergonomically superior package out of high-performance materials. In order for the knife to feel like a larger knife in the hand, it needed well-designed ergonomics. A forefinger-choil and thumb-rest give the hand purchase points, filling out the palm and offering cutting control. 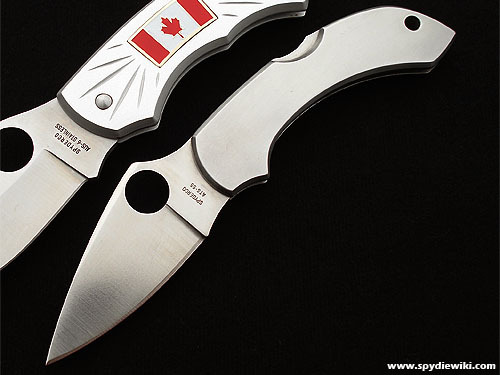 Its leaf-shaped blade is flat-ground VG-10 and the Spyderco Round Hole is 11mm facilitating easy opening. FRN handle is textured with Volcano-Grip and a tip-up integral pocket clip. Low profiled and weighing just over one ounce, the Dragonfly is one of the flagship models in Spyderco's Little Big Guy Knife line up." See also: C28 , C28ET , C28WH . C28GFG . C28T . C28BK2 . C28GRE2 . C28YL2 . The CF variation seems to be the most collectible, though the Santa Fe Stoneworks variants are also rare and expensive. This page was last modified on 20 December 2018, at 19:53.